How to become a Professional Knitter - Robin Hunter Designs: Knitted Art - Who Really Does the Knitting? 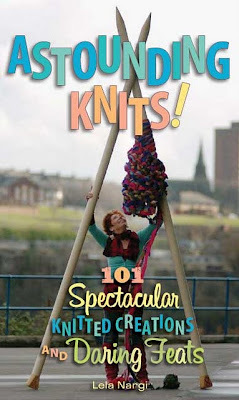 I'm currently reading Astounding Knits by Lela Nargi. It covers many artists who work with knitting as a form of expression. What suddenly struck me as I was reading the artist explanations of the work is how many of them rely on other knitters to produce their work. In some cases it is because they work with "found" objects like thrift store sweaters and integrate them into installation work. In others the artist does the the design work and then gets other knitters to do much of the knitting. This is most common in the large scale installation work. I know other artists like Jeff Koons, have a studio system that involves assistants creating their paintings and sculptures or they out source work to China. When Jeff was interviewed here he said "I used to make all my own sculpture, my paintings, but if I did that it would severely limit the range of projects that I could be involved with. I follow my interests in some way that feels profound to me, those that seem to have a deeper meaning. I feel completely free to do whatever I want to do. But I have to edit my work a lot, because of the process, the amount of time it takes to actually make things, you really have to make the things you want to make, otherwise you’re wasting a lot of energy." In his comments, while he acknowledges not creating the work personally, it is clear that having others make the pieces has no impact on his ownership of the art work as his. I'm curious, how many of you realized that the artist can be very distant from the actual knitting of the art? Labels: Knitted Art - Who Really Does the Knitting?